Last week was a banner week for my level 4 Builder's Base games. Each one (three in all) were finally upgraded to BH5. In each case, I took the apparently unusual step of first maxing every structure on the game grid, most or all of the troops, and leaving the walls at level 2/3. I say "apparently unusual" because it would appear the ONLY way to play right now is to rush to BH6 just as soon as you can. Of course, I say hogwash to that. Yes, it has its benefits but it's not necessary and maxing structures and troops along the way will put you in the best position to be successful at the next level. 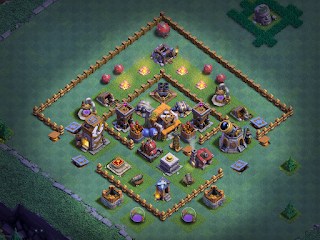 At the very least, you've got to max key troops anyway and it doesn't take much longer to max the structures. I have a very straightforward approach to BH5. 1) Raid during the BH upgrade to fill storages to max. BH4 defenses are maxed and fully operational, so there's really no reason to not raid and having the resources ready to spend when the BH upgrade completes keeps things moving along. 3) Upgrade everything new until you have them all to at least level 4. On this one, you'll want to start with your newly purchased Elixir and Gold storage; they are necessary to have the resource capacity to purchase the MultiMortar and repair the Battle Machine. Once those are upgraded and the Battle Machine repaired, upgrade your Laboratory so you can run troop upgrades. 4) In between things, upgrade the little stuff - mine, elixir collector, gold mine, etc. 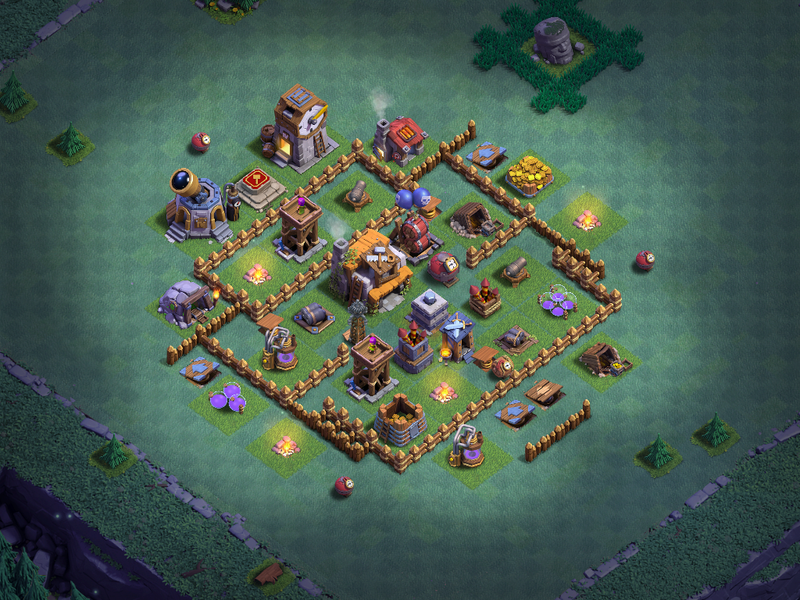 5) As soon as you have the storage capacity and the resources, buy the MultiMortar and repair the Battle Machine. 6) Finish level 4 upgrades for everything except the MultiMortar and Battle Machine. Now - this is where I also divert from the conventional wisdom as well. First and foremost, I do not upgrade the Battle Machine; I only repair it to get it at level 1. A level 5 Battle Machine is great - the ability makes a huge difference in attacks. However, if you take a look at what's required to get it there, you'll realize there are much better ways to spend that elixir in the early part of BH5. As to MultiMortar...I get it to level 2 but then it sits until the very end of BH5 where I alternate it with the Battle Machine. Same reasoning here - it costs a lot of gold (and time) to upgrade with just a small bit of benefit to your overall defenses. That gold can be put into other upgrades. Once the other structures are at level 4, it's time to start getting things to level 5. 7) Upgrade all structures to level 5 and run troop upgrades along the way. a) Air Defenses - Starting with the FireCrackers then the Air Bombs. In between, as I build gold for these upgrades, I'm also upgrading smaller structures - Push Traps, Spring Traps, Mines, MegaMine, Gold Mines, Elixir Collectors. These upgrade quickly when done in between other, more impactful upgrades but you can just as easily run through them first. BTW - I leave the Gem Mine, Clock Tower, and Barracks to dead last in the structure upgrades. At BH5, none of these offer any real value other than being something for enemy troops to beat on. Note that the Cannon Cart does not appear in these lists; that's because it's a fairly useless troop, even as it gets upgraded, so I don't upgrade it until dead last at BH6. It may eventually get a buff but, for now...it just doesn't work well. I was running a variation of an Internet base at BH4 and I liked it, so I decided to try a tweaked version when one of the games went to BH5. Lo and behold - it's actually worked very well so far. This was an interim design, until I repaired the Battle Machine and bought the MultiMortar. Here you can see the design just after I repaired the Battle Machine; before that, I just had the Lab and Clock Tower one space each closer to the other. Base Design is...interesting...at BH5. The types of attacks that come from other players, both BH5 and BH6, are varied. Most are air based (which is why I recommend air defenses be your first upgrades at both BH5 and BH6) but the ground attackers get really good the further you go in the trophy rankings. 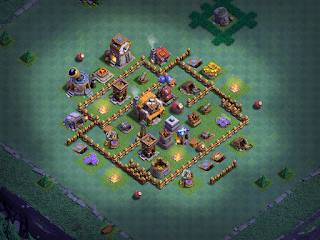 You'll want key defenses to have 3 filled/open blocks between them and the outer perimeter of your base; where you can't do that, add more walls, traps, or high-HP structures. 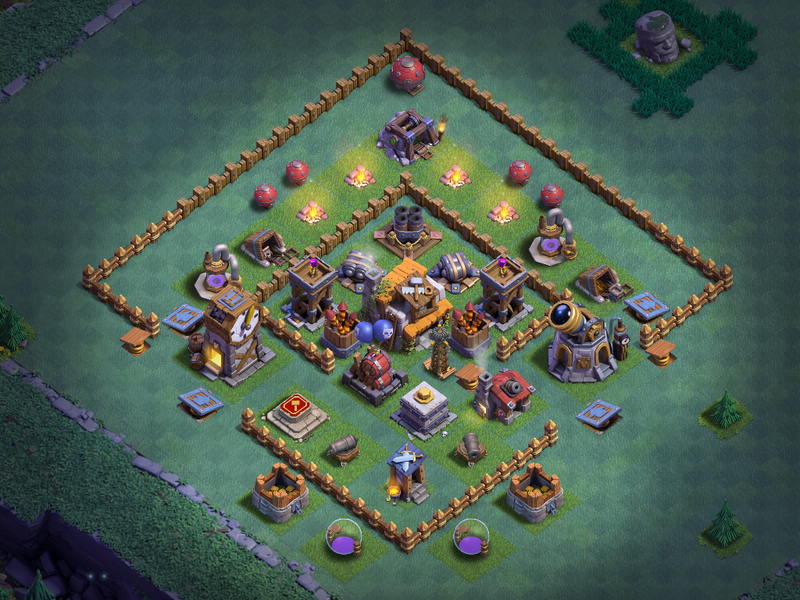 While no base can defend against all types of attacks, this one does well against many. This is my one gripe at BH5; there's just no really good, creative base designs. Most bases are either diamonds or some variation of the diamond design. I've been tinkering with a bunch of different base designs but none have the same, general applicability to the game as the diamond. This gets better at BH6 but not much. The sweet spot in trophies for BH4 is 1800ish trophies. For BH5, it's right around 2500 trophies. I've only just started playing these three games at BH5 so they are hovering around 2000. There's an inaccurate belief that you can no longer play at higher trophy levels as a BH5; that's just not true. My near max BH5s are running 2500+ trophies and these have already moved up 200+ trophies on just the three daily attacks. Over the next several days, I will continue to work on each game using the same upgrade paths I mention above. At the moment, all three have both the MultiMortar and the Battle Machine, so I'm in the process of bringing new items to level 4 and upgrading little things (traps and the like). Beta Minions have just started upgrading today as well. NaidCosanta, ZedVerteidigung, and Clash Maniac are at 1994, 1971, and 1962 trophies (respectively) and they're running up and down between 1900-2100 as new defenses/troops upgrade. I anticipate they'll hit the 2500ish mark by the end of the upcoming weekend, if not sooner. The older BH5 games are doing very well too. I'll be bringing some new updates there, along with another new base design, later this week. (You can always tell when I'm tinkering with new bases because my trophies drop from the sweet spot.) Each of these games is on the last few level 5 upgrades now and will soon be moving to BH6. More on that next time...!